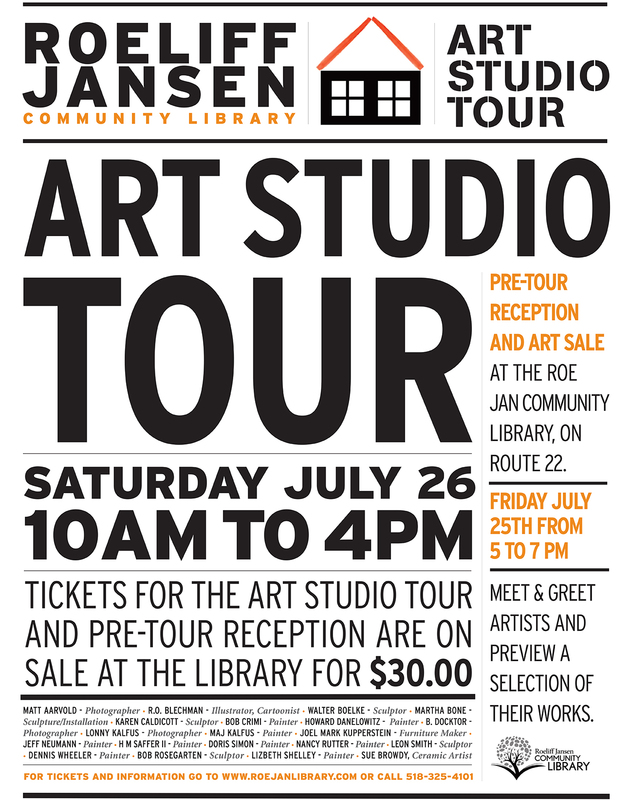 The Roeliff Jansen Community Library Art Studio Tour is happening this Saturday July 26, 2014 from 10-4. This is a wonderful chance to meet the artists and see where they work, the views and things that inspire them. I’d love to take the tour–but I can’t since I’m one of the artists on the tour. But I have had the good fortune to photograph Bob Blechman, Maj & Lonny Kalfus, HM Saffer, and Leon Smith, and have been at the studios of Jeff Neumann, Bob Rosegarten, and Sue Browdy–so I can report that it is great fun, fascinating, and uplifting to do the tour. And of course I hope you will come visit me at my place in Ancram. I am not a studio photographer, so you won’t see my studio, but my home and garden will be open, and I’ll be happy to meet you. All the photos on my walls will be for sale, as well as many very affordable prints on paper (which will be gorgeous framed), and greeting cards. I love having the opportunity to show all the different ways my work can be presented in this amazing digital age. In addition to traditionally matted and framed prints, I love making prints on canvas which are wrapped around a wooden frame. Because there is no glass involved, the prints don’t reflect all the windows, and they give a feeling of being there in the scene that works so beautifully for my landscapes and farm animal photos. Occasionally I print on metal which works wonderfully for watery scenes, or images where I want additional snap. A pre-tour reception with the artists, showing representative examples of their work, will be held at the Library from 5 to 7 p.m., Friday, July 25. The art work will remain on display until August 23rd. The artists who are opening their studios this year include Matt Aarvold, photographer; R.O. Blechman, illustrator, cartoonist; Walter Boelke, sculptor; Martha Bone, sculpture/installation; Karen Caldicott, sculptor; Bob Crimi, painter; Howard Danelowitz, painter; B. Docktor, photographer; Lonny Kalfus, photographer; Maj Kalfus, painter; Joel Mark Kupperstein; furniture maker; Jeff Neumann, painter; H M Saffer II, painter; Doris Simon; painter; Nancy Rutter, painter; Leon Smith, sculptor; and Dennis Wheeler, painter; Bob Rosegarten, sculptor; Lizbeth Shelley, painter and Sue Browdy, ceramic artist. The Roeliff Jansen Community Library, which is chartered to serve Ancram, Copake and Hillsdale, is located at 9091 Rt. 22, approximately one mile south of the light at the intersection of Routes 22 and 23 in Hillsdale. For information on hours and events, call 518-325-4101, or visit the library’s website atwww.roejanlibrary.org.